For all the talk of a nomadic footballing lifestyle, it is not often that these pages have dipped beneath step six of the non-league pyramid. Wrongly so, as we could all do well to challenge our expectations from time to time. Once you come down to this level, the amateur hours go on and on, and presumption might tell me that it will involve visiting grounds so austere that entry is not by programme, but by ration book. If there is a tea-hut, requests for a second Kit-Kat will likely be met with the kind of look that an affair of secretaries might give a dieting colleague rapidly wiping a tiny freckle of synthetic cream away from the tip of their nose, on their return from a lengthy session of conference room minute-taking. You/I/we might expect that some of the grounds at this level are a mere length of missing rope away from being a parks football pitch. …and, you/I/we might assume, open to the elements here at Bedfont, once the rain begins to fall in the second half (this is not what I signed up for going to watch football five days before June, I can tell you). However despite my claims above, the Middlesex County League is pretty well catered for in terms of grounds, largely thanks to a number of sharing arrangements with clubs higher up, but Bedfont skew the curve even further by having a quite nicely appointed ground of their own. 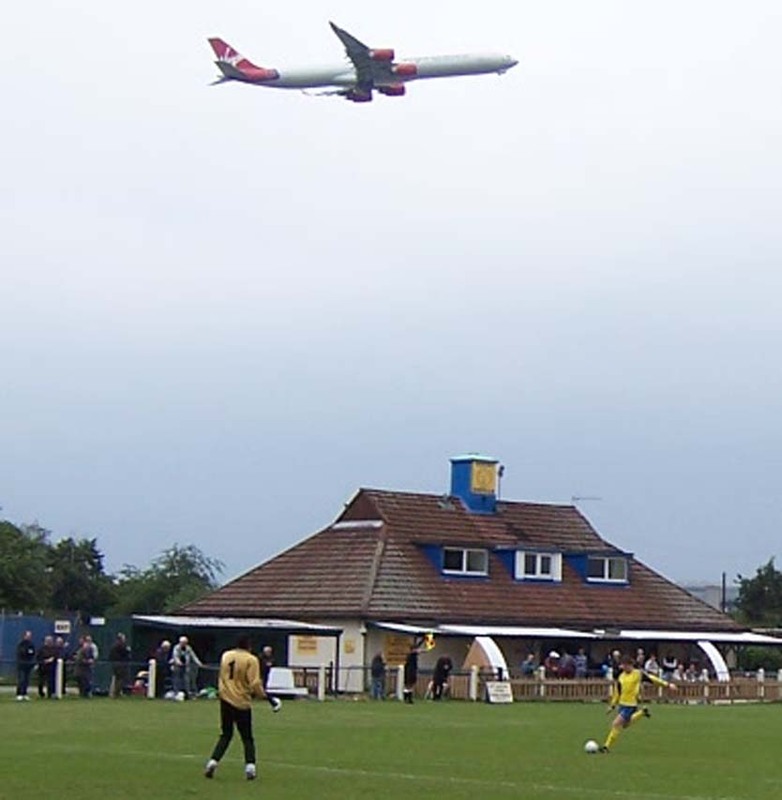 Bedfont sports club is situated slap bang at the end of Heathrow’s take-off runway and squeezed between some allotments, one which has a bonfire on the go this afternoon, its smoke spiralling up towards the regularly plane-interrupted skies, and the fenced in home of the more senior Bedfont FC, currently two steps ahead of Sports in the Combined Counties League Premier Division. However, Sports clearly have their sights set on joining their neighbours in the CCL set-up at some stage as they have permission for lights, and are clearly in the process of adding to the hard-standing around their boundary, a load of rubble filling a trench thirsty for the concrete that the summer is likely to bring. 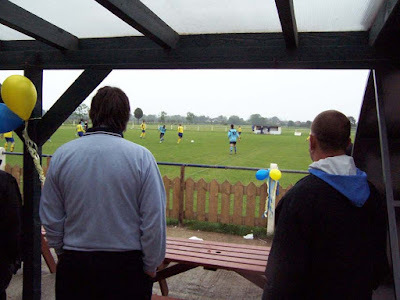 So, despite the picture that one might paint of the aesthetics of the county leagues, the constituency of Middlesex’s appears fairly rich, particularly with the presence of a number of south European and south American ex-pat teams, such as Sport London e Benfica, Brazilian and FC Deportivo Galicia. However, the further you delve into the amateur ranks, the more chaotic the organisation gets. 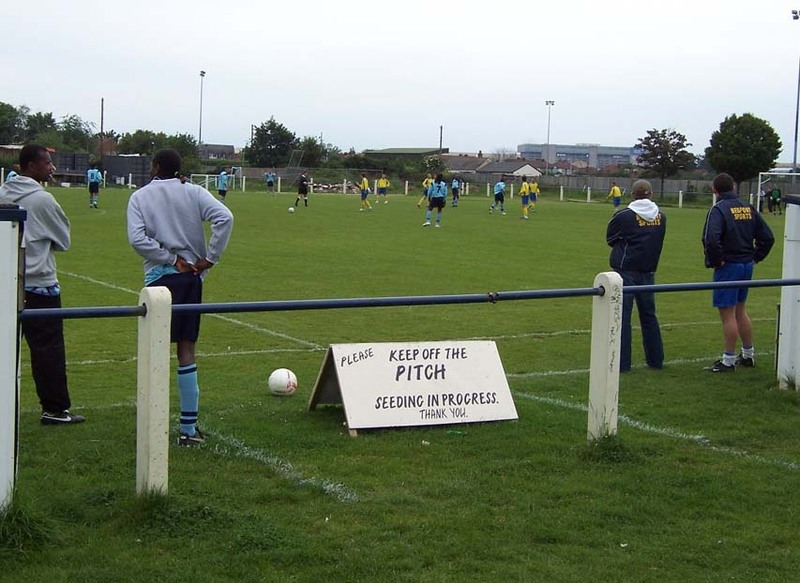 Twelve games of this MCL season have been awarded by committee, often due to a no-show by the away side, or in Southall’s case on several occasions, the home team. However, even at this level there is colour, as balloons in the appropriate yellow and blue are on show, with attempts to justify their presence by having two attached with string to a happy child’s wrist. Walthamstow Avenue & Pennant are particularly skilful looking, full of thoughtful yet rapid first touch passing, while Bedfont are also a pretty good advert for their level, as 103 goals so far this season would suggest. For the first quarter, they cancel each other out, A&P making the first genuine chance, a quick shot on the turn looping as though about to sail just under the bar, but keeper Barry Macwilliam flicks it away. However he makes a blunder from the resulting corner, his brush this time being more flimsy than a tracing paper oar. A header is required at the far post to save him. A minute later, another twenty-yarder requires a tip, round the post this time, as Macwilliam works up a sweat. On forty minutes, Sports have their first decent opportunity with a shot from range, welting a shot that beats the keeper’s dive but also the post. This wakes the home side up to their abilities, and they press forward with much more purpose and create two further chances in quick succession, but the spidery limbs of Walthamstow’s tall keeper keeps them at bay. On the stroke of half time, a Bedfont corner is whipped in by Mark Smith beautifully to the six yard line, but Ricky Owen’s header catches the join of post and bar and bounces out. Much less than it deserved. A moral goal. Now those don’t all count. Walthamstow come out after the break re-energised and another gorgeous lilting wallop skims an inch over the bar. Ten minutes later, Spider goes down well and bravely at feet to stem a gilt-edged one-on-one chance. On seventy-five minutes, Walthamstow have the ball in the net, taking out the keeper in the process. After an age of celebration, everyone finally notices the linesman’s flag. Ten minutes later, with five minutes to go, A&P finally score legitimately. The offside trap is broken, and a tackle is made, but rather than going down the attacker crosses softly, the ball bouncing off a sliding defenders hand, and before the keeper can land on it, A&P’s dreadlocked midfielder toe-pokes it home. It is a finish that doesn’t do justice to his very apparent ball-skills. All told, Bedfont have no answer to Walthamstow today, despite the fact they have outscored everyone else in their division this season (25 ahead of the next highest tally, and a nice looking differential of +63). Today is very much about the wind-down, yet it’s not even their last scheduled game. However that final game never gets played. Away to Southall. Poor little fixture never had a chance, sniff. With home side suspended by the league seemingly due to a break in communication (the club secretary resigned months ago, apparently). However those three points are not enough for Sports to finish in a coveted promotion position, pipped by Sport London e Benfica, who will move up to the Spartan South Midlands League second tier, and Neasden Foundation, who will ascend to the same level within the Combined Counties League. Both have been able to make the jump thanks to the facilities that come with ground sharing. All the cool clubs are doing it, I’m told.